The city has created an ambitious Climate Action Plan that allows measurement and monitoring of climate risks within the city. It has created an emissions inventory using The Global Protocol for Community-Scale Greenhouse Gas Emission Inventories (GPC). It is the first Brazilian city to complete a study on climate vulnerabilities and has set an emission reduction target of 20% by 2020. This is expected to prevent the release of 2.3m tonnes of greenhouse gases. Just last week it announced plans to produce 2.8GWh of solar energy per year through its new super highway. Rio Mayor Eduardo Paes said: “I am proud that Rio de Janeiro is the first global city to become fully compliant with the Compact of Mayors, and I call on all cities to join this critical initiative on the Road to Paris and beyond. The Compact of Mayors was launched by UN Secretary-General Ban Ki-moon and his Special Envoy for Cities and Climate Change, Michael R. Bloomberg. The Compact establishes a global platform to capture the impact of cities’ collective actions through measurement of emissions and climate risk through public documentation of their efforts. 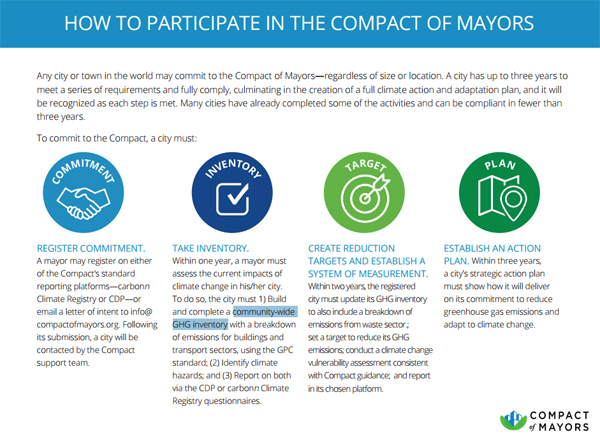 Over the course of three years or less a city must meet the four requirements of the Compact to become fully committed. The four commitments are shown below. Earlier this week, US President Barack Obama announced that 15 new US cities have joined the Compact of Mayors, and set a goal of having 100 U.S. cities registered in before the Paris talks. The Compact currently has over 100 cities registered with some well on their way to joining Rio as fully committed. London is halfway to a fully committed status, while Bristol only needs to build and complete an emissions inventory to meet the requirements.